Quick and Easy Removals are highly experience interstate removalists and provide an exceptional long distance removal service for a very affordable price. We move customer’s furniture and belongings from and to Sydney, Melbourne, Brisbane, Adelaide, Canberra and Queensland’s Sunshine and Gold Coasts and all the country areas in between. We are experienced in commercial and residential interstate relocations. We can move a studio apartment through to a large organisation ñ all with the same high standard of service and at affordable rates. 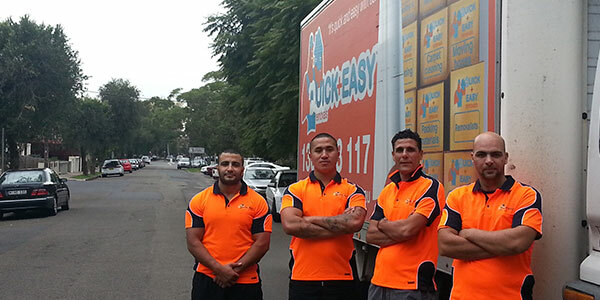 Quick and Easy Removals have established a reputation of the years as one of Australia’s leading removal companies. This reputation has been earned by our friendly and professional approach, competitive rates, well maintained vehicles and fully trained staff. If you are planning to relocate to another state, whether in one of the major cities or somewhere more remote, our long distance service will help to ensure that your move is completed with the minimum of fuss and without any annoying delays. We take great pride in our work and always strive to make sure that our customers are completely satisfied with the service that they receive. Because we will transport your furniture and other belongings in a separate truck, there is no danger of your prized possessions going to the wrong destination or becoming mixed up with those of another customer. A pre-packing service is available that can help to take the hard work out of your home or office relocation and we can promise you that our operatives will take every care when handling fragile items and loading them into one of our vehicles ready for transportation to your new home. Believe it or not interstate moves can be positively pleasurable with the help and assistance of our experienced staff. To help make your interstate relocation as seamless as possible we provide a cleaning service. Our proficient and speedy cleaners can make your vacated home/office spotless for the next family/tenants. After reading the above, you might assume that we charge premium prices for our premium services but you would be wrong. We believe that our customers are entitled to highly competitive rates as well as the very best service we can offer and we charge fixed prices that are very reasonable for customers that are relocating from Sydney to Brisbane, to Melbourne and to Adelaide etc. To find out exactly how much it will cost for you to take advantage of interstate removals service or to ask for further details, please call or email us at your convenience. On average transit time for an interstate removal from several different locations are provided below. Please note this is not a complete list of destinations or origins within our service area. Do call us on (02) 8599 2235 or email us info@quickandeasyremovals.com.au and you can be certain that our staff (not call centre) will be able to answer any questions you have as well as provide you with some sound advice based on years of knowledge regarding your planned interstate relocation. Quick and Easy Removals are Experts in Interstate Removals. Call Quick & Easy Removals today on (02) 8599 2235 or fill out our easy online form for an obligation-free quote!